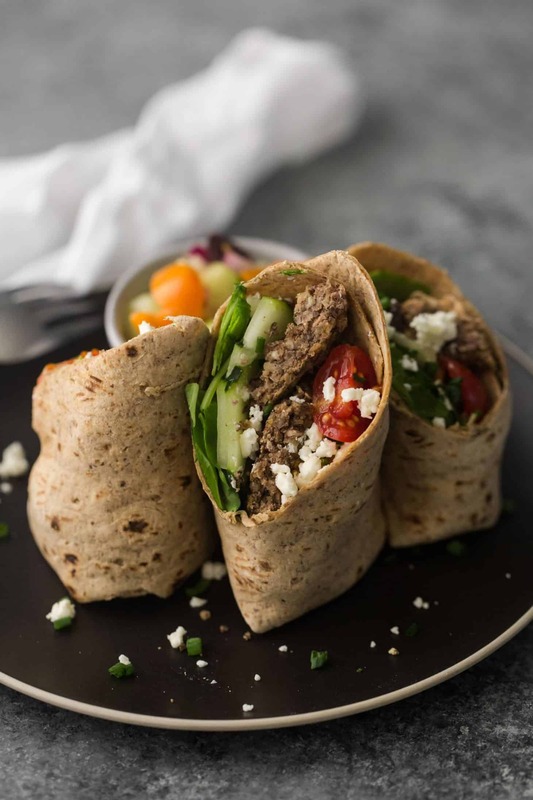 Mediterranean Wrap with Lentil Bites | Naturally. Preparing more plant-based meals can be time intensive. There’s usually quite a bit of prepping and cooking which can sometimes discourage you from trying a recipe. However, one of my favorite things to address this is to find recipes that allow for overlapping ingredients/components. Take this mediterranean wrap for example. The lentil bites can be used in these wraps, on top of pasta, or smothered in an easy cream sauce. Make an extra large batch and use these lentil bites for multiple meals! 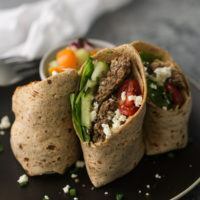 A hearty vegetarian wrap that uses my favorite lentil bites combined with spinach, feta, and tomatoes. In a food processor, add all ingredients for lentil bites. Pulse to combine. Mixture should be well blended and moist but retain a coarse texture. With the lentil mixture, form 12 patties, roughly 2 tablespoons of mixture per patty. Place patties on a baking tray covered with parchment paper. Bake 15 minutes at 425°F. Flip patties and bake 5 minutes more. Let cool slightly before assembling wraps. While patties are baking, slice cucumber into thin half moons. Cut cherry tomatoes and olives in half. To assemble, lay wrap out on a flat surface. Place half the spinach onto the wrap. Layer cucumber, tomato and olives. Place 2 patties on top of vegetables. Sprinkle with chives and feta. Roll, tucking in the sides as you go. Repeat with remaining wrap. Cut each wrap in half to serve. Tips & Tricks: Any leftover lentil bites would be great on top of salads. The wrap fillings are more than needed for two wraps. Serve as a side salad or save for another wrap. Don’t have a food processor? Stir together the ingredients for the lentil bites. Then use a potato masher to combine. Spreads: Before placing spinach on the mediterranean wrap, add a spread of hummus, harissa or baba ghanoush. Greens: I often use spinach in wraps, but any leaf lettuce or kale would be fine. Vegan: Leave out the feta and use a flax egg in the lentil bites to keep it vegan. During the cooler months, I always find myself less likely to pack lunches. It’s harder to get out of bed with the darker mornings. Wraps and sandwiches are always my go-to because I can throw something healthy together in very little time. 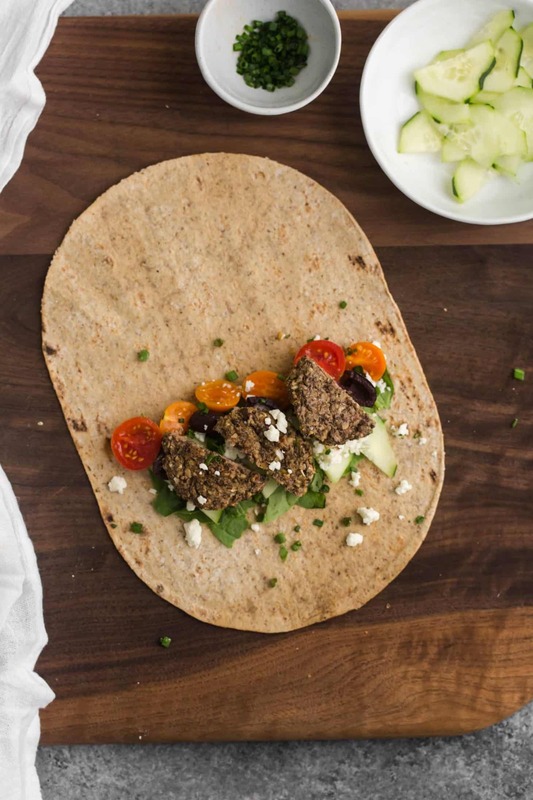 These multigrain wraps from Flatout are perfect for a quicker turnaround and healthier lunch! This looks so delicious! I can’t wait to try this out asap! I make a lot of Mediterranean wraps, I’m excited to try them with the lentil bites! I only have red lentils on hand, is there a reason not to use those in the recipe, or is it just for color? Red lentils don’t have the same texture as the green/brown ones. They turn mush too much! Just a question … the notes say omitting the feta would make it vegan, but what about the egg in the lentil bites? Any suggestions for swapping that out? Whoops! We left out that note- flax eggs work well in place of the regular egg. These are amazing!! I was just looking for a mediterranean/middle eastern inspired dish to make along side a middle eastern spiced soup!! These fit the bill excellently!! Thank you!!!! 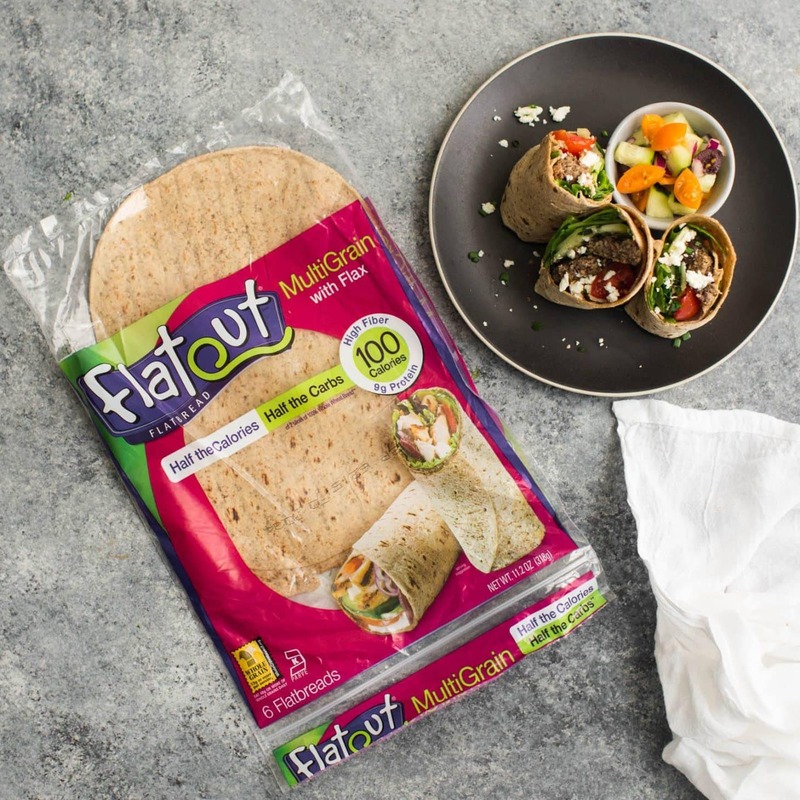 I am a fan of Mediterranean Flavors and Flatout seems to be the perfect vessel for many wraps. thanks for sharing the recipe I will give it a try soon. Looks perfect for lunch … I’ll have to give it a go! Looking really delicious, I hope I’ll get to try this soon!